Our range of products include pneumatic training rig c/w basic pneumatic component kits, wind generator, wind turbine absorbing dynamometers and wind generator, solar energy demonstration equipment, acidity (ph) control apparatus and fuel cell demonstration unit. Advanced Technocracy Inc. is Manufacturer, Exporter & Supplier of Pneumatic Training Rig C/W Basic Pneumatic Component Kits . The increasing use of pneumatic circuitry in industry has created a growing demand for detailed knowledge of the subject. The “Pneumatic Circuit Trainer” has been developed in conjunction with leading companies in industrial pneumatics, and along with its comprehensive User Manual forms the basis of a complete course in pneumatics suitable for use in Educational and Industrial Establishments. The order of the experiments presented, is intended to give a progressively expanding insight into pneumatic components and circuit design. Advanced Technocracy Inc. is Manufacturer, Exporter & Supplier of Wind Generator . The wind Generator is designed to test small size wind power type turbines of up to 450 mm blade diameter. The equipment is sized to allow its use inside a laboratory that does not have access to a wind tunnel.The equipment includes a speed controlled wind generator fan giving a maximum discharge flow of 10m/s in a 500mm diameter duct. This wind speed is considered to be representative of wind speed ratings for this size of turbine. A DC motor is used which will produce sufficient power at reduced rotational speeds thus eliminating the requirement for a gearbox or belt drive system. The DC motor is directly connected to the turbine shaft to produce current. This is fed into a 4 quadrant DC Drive and a potentiometer on the front panel is used to adjust the load which is dissipating back into the supply. The voltage, current and turbine speed are measured and data logged. The discharge flow is passed through a honeycomb type flow straightening element. This reduces the swirl induced in the air onto the test turbine face. 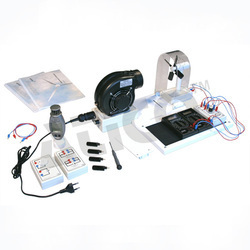 The wind speed is accurately controlled by varying the fan speed using an inverter drive module. The irflow speed is measured using a pitot static tube & a low range differential pressure transducer..
Advanced Technocracy Inc. is Manufacturer, Exporter & Supplier of Wind Turbine Absorbing Dynamometers and Wind Generator. Advanced Technocracy Inc. is Manufacturer, Exporter & Supplier of Solar Energy Demonstration. This experiment includes a shallow heat collection tray approximately 1.2 m by 1m, the base of which is fitted with removable heat capture material. This material assists in the heat transfer process. The heat capture and transfer plate is itself covered by a sheet of flat plate glass, which captures the radiation and reflects light back to the heat. Water is pumped through the heat transfer plate, on the tray, and is returned to an insulated reservoir mounted on the base of the unit. The water is continuously re-circulated through the transfer plate so that the temperature in the reservoir gradually builds up. A heat exchanger coil is built into the reservoir such that the water temperature within the reservoir can be controlled by allowing cooler mains water to flow through the heat exchanger coil. An inclinometer to indicate the degree of tilt is available as an optional extra. Temperature measurement by multi-point thermocouple instrument is provided at the following points- reservoir water, water onto and off the heat transfer plate, ambient, glass (outside), centre of tray (under mat), mat (top side). An optional pen recorder is available to continuously record these temperatures or the data capture device can be used. Feed water flow rate is measurable and variable. This allows different durations of water exposure to the heat tray. Optionally water pressure can be measured. The unit is mounted so that the base can be tilted continuously by between +10 and -10 to the horizontal allowing adjustment of the tray to the sunlight. The whole top section of the still may be turned horizontally through 180, so making it possible to alter the angle of incidence of sunlight on the absorbing pad, while keeping the film flow slope constant, as well as extending the range of tray angles and hence flow rates available. Should natural sunlight not be available an optional 1kW light source can be used to simulate sunlight. The light source is mounted on a tripod giving some adjustment to height and angle of the light. 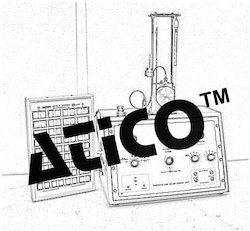 Advanced Technocracy Inc. is Manufacturer, Exporter & Supplier of Acidity (Ph) Control Apparatus. 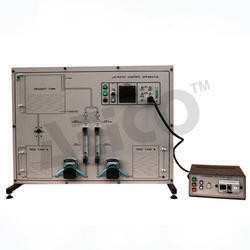 pH Control Apparatus is designed to demonstrate the control of the acidity of a water supply by chemical dosing. Control of pH is an important aspect of water treatment in water cooling systems, hot water heating systems and boiler feed water. Two methods are available to control the addition of the dosing chemical, either slug (on-off) dosing or continuous controlled injection. Both methods can be demonstrated with this apparatus. 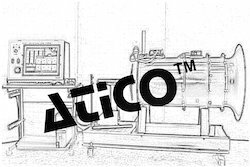 Optional equipment is available to convert the apparatus into a Ratio Control Apparatus. 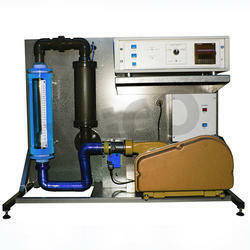 Advanced Technocracy Inc. is Manufacturer, Exporter & Supplier of Fuel Cell Demonstration unit . As shown in the illustration, the power element in the unit is a Hydrogen / Air fuel cell comprising ten cells in a stack connected to a control unit incorporating a loading system consisting of a variable rheostat, Ammeter and Voltmeter. The characteristics of the fuel cell array can be determined by the instrumentation provided. Provision is made for the use of data logger, to log the output of the fuel cell. The fuel cell employed is a PEM type giving an energy conversion of around 40%. The cells are a polymer membrane coated with platinum sandwiched between two machined plates. The plates are then sandwiched into a 10 cell assembly between two steel end panels which form the electrodes. 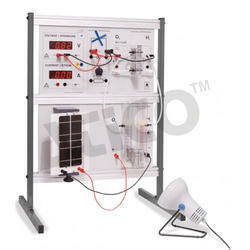 Advanced Technocracy Inc. is Manufacturer, Exporter & Supplier of Solar Energy Apparatus. Advanced Technocracy Inc. is Manufacturer, Exporter & Supplier of Photovoltaic Solar Power Unit. 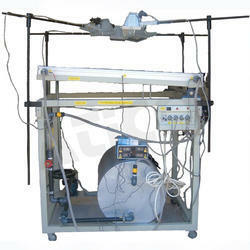 loading system consisting of an electric motor and dynamometer and a bank of resistors. mounted out of doors at an angle to the horizontal, the angle being determined by the latitude of the location, alternatively a suitable lamp can be used. the whole unit is independent of mains electricity supply. Advanced Technocracy Inc. is Manufacturer, Exporter & Supplier of Solar Distillation Apparatus . 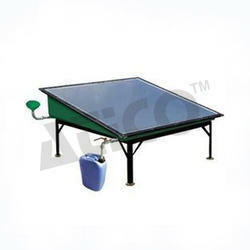 These units comprise instrumented versions of the two types of solar still in common use. Standardised design makes possible for the first time the comparison of results obtained in different places - many solar stills are in use, but true performance comparison has hitherto been impossible. Used as a pair these units also make possible simultaneous and so controlled experiments on the comparative performance of the two types of solar still. Output of distillate under tropical conditions is typically up to 5 litres per day. 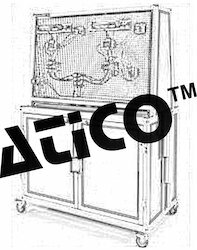 Advanced Technocracy Inc. is Manufacturer, Exporter & Supplier of Temperature Control Apparatus, Three Term Electronic. 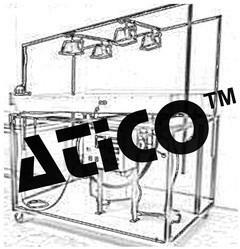 Bench Top Temperature Control Apparatus utilizing control components typical of current industrial applications. The apparatus comprises An air flow circuit consisting of a belt driven blower unit, blower motor, electrically operated air flow valve, variable area flow meter, air flow ducting, and a process model with thermal overload protection, simulating an exothermic chemical reaction process. 1 . A control unit comprising a steel instrumentation case housing a three term digital microprocessor controller with adjustable ranges of 0-100%, 0 to 10 minutes, and 0 to 400 seconds on the proportional band, integral time and derivative time respectively; multi-position temperature control switch with fine control potentiometer; hermocouple selection switch;and push-button switches/indicators for the power supply and the blower motor. 2 . A welded steel frame and backplate housing the foregoing components. Looking for Renewable Energies ?